This collection of articles is a good research source for anyone interested in learning more about the Indianapolis Motor Speedway's project to pave the track with bricks during the autumn of 1909. This action was triggered by the tragic events of the Speedway's first auto race in August 1909. This collection focuses on the December time trial events that yielded new records and demonstrated the speed and improved safety of the facility. The weather was brutally cold, sinking to as low as 9 degrees. The track was covered in snow earlier in the week and Director of Contests Ernest Moross announced that he would pour gasoline on the bricks and set them afire if necessary to clear the Speedway for the trials. Temperatures were so biting that the drivers created homemade chamois balaclavas to protect their skin. This article from October discusses ambitious plans by Indianapolis Motor Speedway management to stage races in the autumn of 1909. The races never materialized, but the Speedway did stage a time trial event during some unusually frigid weather in December. This article describes the planned events for the December 17, 1909 time trial at the Indianapolis Motor Speedway. 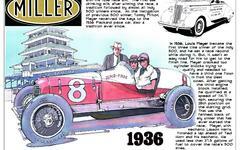 This was published the morning of the event in the Indianapolis Star, so the time trials were yet to be run. However, it provides a nice update to the practice that had occurred up to that point. This is a nice collection of articles that summarizes the first day of the December 1909 speed trials at the Indianapolis Motor Speedway and sets up the second day. This is an excellent collection of articles covering the second and final day of the Indianapolis Motor Speedway 1909 time trials. Lewis Strang set a new five mile mark and J. Walter Christie blew away the old quarter mile record. Some good images are included - not high quality, but interesting. Contained in this attachment is an image that appeared in the Indianapolis Star on December 18, 1909. It was taken during the Indianapolis Motor Speedway's December 17 & 18 time trials on the new brick running surface. The article in attachment Moross111909 was originally published in the Indianapolis Star on November 19, 1909. The article in attachment IMStrials120409 originally appeared in the December 4, 1909 Indianapolis Star. The article in attachment IMStrials120509 was originally published in the Indianapolis Star on December 5, 1909. It reports on the growing list of entries for the December 17 and 18, 1909 time trials event at the Indianapolis Motor Speedway. This was the first event after the track was paved with bricks. The article in attachment IMStrials121209 originally appeared in the December 12, 1909, Indianapolis Star. This article discusses the expectations for world speed records at the Indianapolis Motor Speedway at the planned December 17 and 18, 1909 time trials. The article in attachment IMStrials121509 was first published in the Indianapolis Star December 15, 1909. This article reports on the initial practice laps on the newly brick paved Indianapolis Motor Speedway from the previous day, December 14.